I've developed a technique I like to use for the binding that I think you'll enjoy. I'm not laying claim that it's the proper or "right" way it should be done I'm just saying that it's the way I've discovered I like to do it. I've been using the coverstitch machine however you can get by just fine utilizing a standard zigzag machine as well. This has been *so* helpful. I've been trying to figure out how to approach binding a knit fabric, and here's a great method. Thanks! I will definitely be making this - thank you! It's a really flattering syle for both men and women and really comfortable to wear. It's interesting to see how you do things differently than me. Thanks for taking the time to put this together. I know it took a lot longer than the hour of video. Thanks for taking so much time to make this video. I have never used my coverstitch machine for binding. I've been too intimidated since I don't have a binding attachment. You showed me that I don't need one. I can't wait to try your technique. I've really enjoyed all of your videos. You are a very generous sewer. Great video. It is real cool to see how others do something. I do pretty much the same thing for binding, but first attach it with the serger instead of the straight stitch. It does make the coverstitch so easy. attaching the binding first, without having to have a crazy attachment for the machine. Sewing around the edge twice seems like more work, but not having to measure as you fold the binding, knowing you will have an even edge is worth it. HI Brian, thanks for the video. I noticed you have the same cutting table as I do. I had my husband get some plastic plumbing tubes from the hardware store and he cut them about 12 to 15" and then slipped them on the feet of the table. This raises the table and saves the back when cutting, but can be easily taken off when not needed. I love looking at your blog, it's always informative. That is a dang fine tank top. It was definitely worth it to make so many to come up with the perfect one! Thank you so much for the video and keeping us posted on your process along the way on this. I know I learned a lot from it. Excellent! Thank you for the great video and for using material with a contrasting thread. The contrasting thread really helped. I'll be using the binding technique you demonstrated. The video and shirt were excellent. Thank You for useful videos. It is informative and easy understandable! I don't know where my comment went to...but I was trying to bring to your attention Patrick Patterson's Youtube videos. His Youtube name is CuttingUpWithPatrick. Not too sure about the caps but check them out when you get the chance. your site is hard to get out of! so much to see and read. Intelligent, humorous and respectful - I'm always inspired. Your mom must be really proud of you! What a great video. I now know how to sew seam bindings! I like how you pull the threads when you finish serging to finish it off -- great tip. This is GREAT!! you helped me out A LOT!! especially with the trimming. I've tried your technique with taking vintage t-shirts and making them into tank tops and it worked. I love your blog and video tutorials great. I have told a few of my friends and will link to from blog WWW.OMGCOCO.COM . Keep up the EXCELLENT WORK!! I have nominated you for the Versatile Blogger Award! You can copy and paste the icon from my blog. There are rules of acceptance. I love your blog! Hey great video! I often avoid topstitched bindings since I don't have a coverlock machine. I usually serge my binding strips on in one go. It was really great to see a video of a coverlock in use. I'm excited about trying your pattern out, but unfortunately I can't get it to open. What type of file is that? I have a mac mini but no fancy (pricey) programs on it. Hi Brian - LOVE your tank pattern but the link to the pattern is not working. Would you be able to post it again? Thanks so much. Keep up the great sewing. Same here. The link to the pattern stopped working. Can you please repost or email to triathlete1045671@yahoo.com? Thank you. your blog is amazing! I've really learned a lot from your video tutorials. What machine are you using in the final part of the video here? When I try to do the same with my own machine (Elna 2110), that is a zig-zag over the hem, I am really not able to get the same result. The machine will stretch the fabric too much and it will come out looking really unpretty. I tried to lower the foot preassure at minimum, but it still doesn't help. I think I should get another machine. Is there a specific feature you suggest I should look for? Just another voice asking you to investigate the broken link to the pattern. Thanks for amazing instructional video, taught me umpteen different tricks that this wet-behind-the-ears sewer needed to know. this is great thank you. do you mind sharing the model of your electronic scissors? are you happy with them still? if not, do you have thoughts on pairs that are better? thanks for any insights you might offer. I absolutely LOVED your video thanks so much!! I keep getting a 404 error!! I absolutely LOVED your video thanks so much!! Your video is very helpful. I loved your video showing you trying on the different versions of your tank top. You did an outstanding job. I loved how you kept at it until it was perfect! I tried to download your pattern, but it wasn't available. I guess that's understandable since it was 6 years ago! I would love to make one of these. Hi! Loved this video. 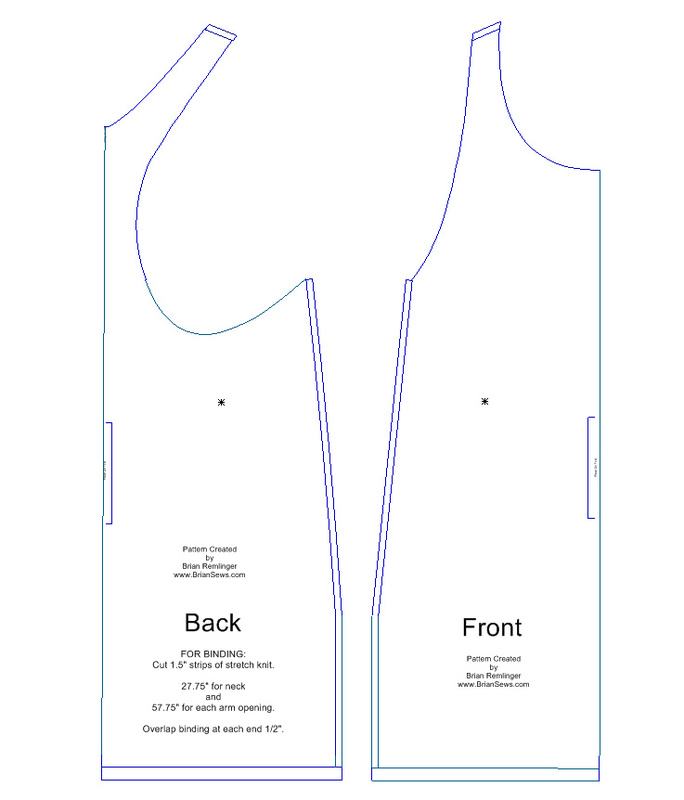 I would love to make one of these tanktops, but the pattern download link gives me an error. I guess this was a long time ago, but if you ever check this, I would love it if you could send me that pattern. Thank you. Hi brian - I watched your y back tank top videos and I wanted to say THANK YOU!! I love the few y backs I have purchased, and it’s so hard to find good men’s tank tops for a good price. As a newbie to sewing, I felt your video and explanation was easy enough for me to grasp. I think right now the hardest part will be printing the pattern! Thank you again!